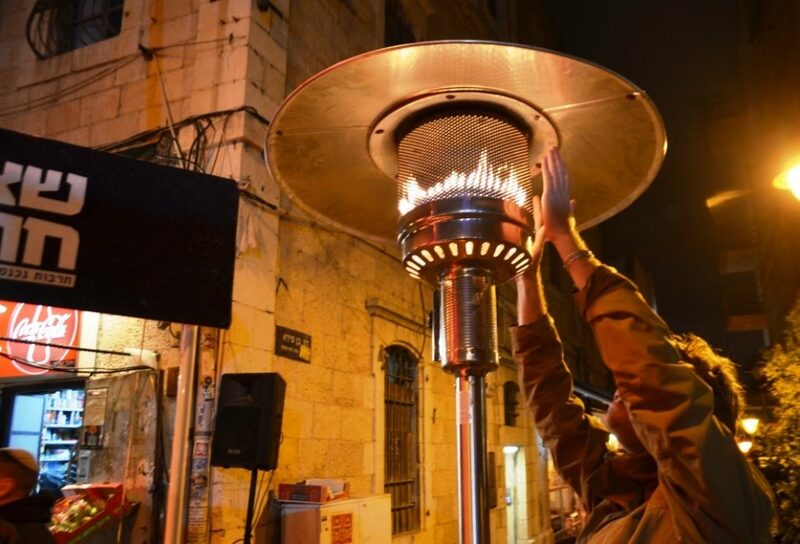 Jerusalem, Israel, winter nights are long and the temperatures are low. 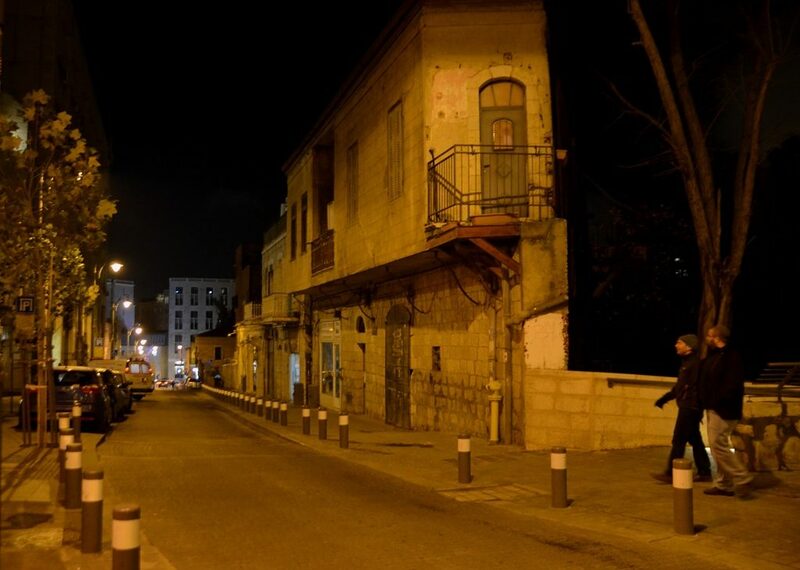 The old narrow streets can be dark, cold, and quiet. 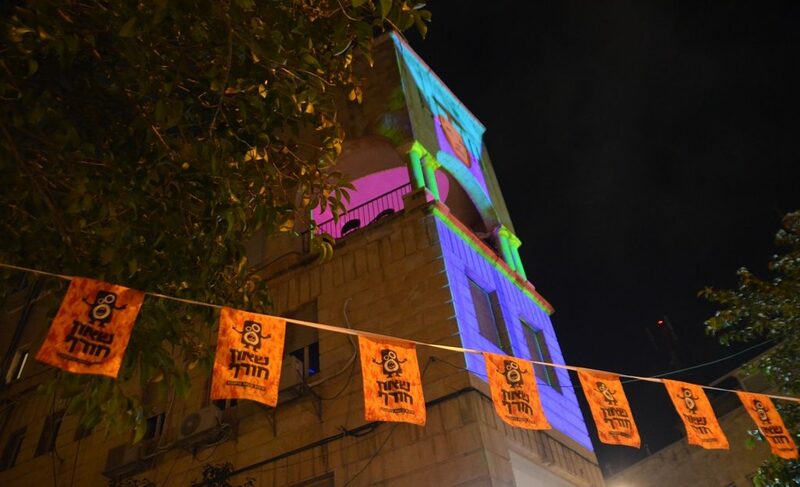 To bring people to the city streets on winter nights, a street festival שאון חורף – Shaon Horef, or Winter Noise was started over seven years ago. 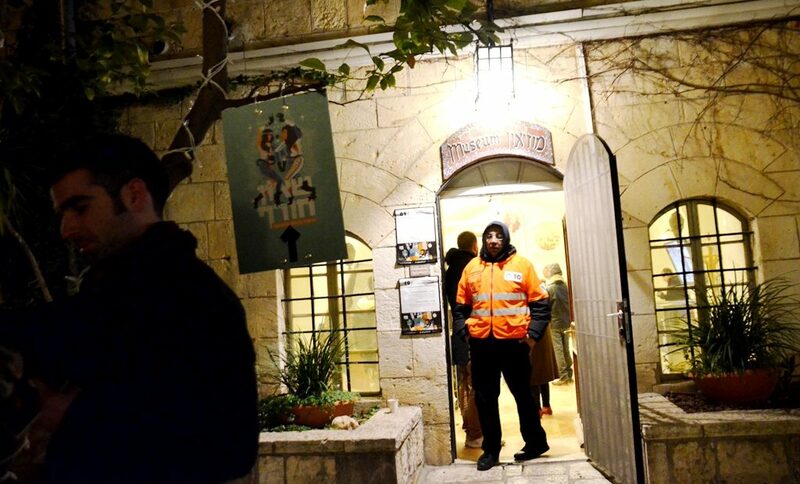 Shaon Horef is held in a different location each Monday night in February. 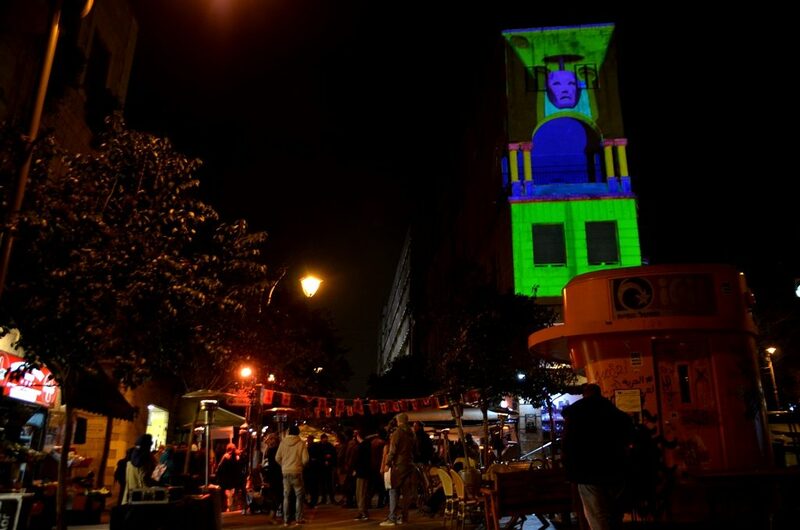 The free cultural festival features varied and often “out of the box” entertainment. 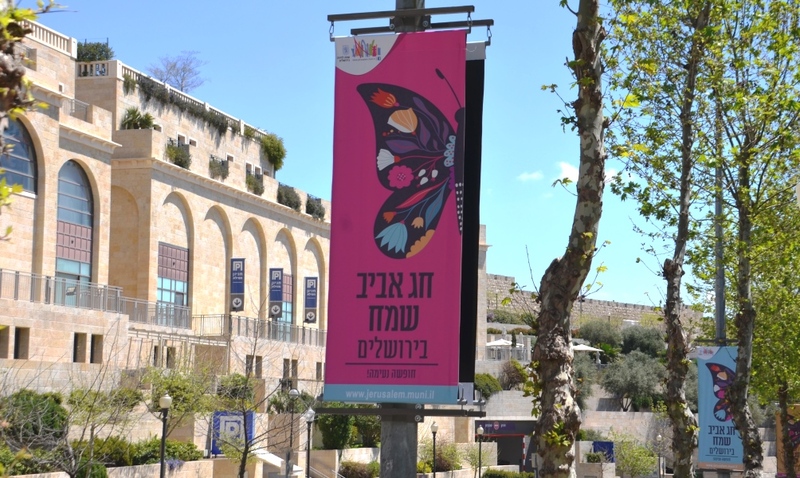 On February 11, Ben Shetach and Shlomzion Streets were featured. 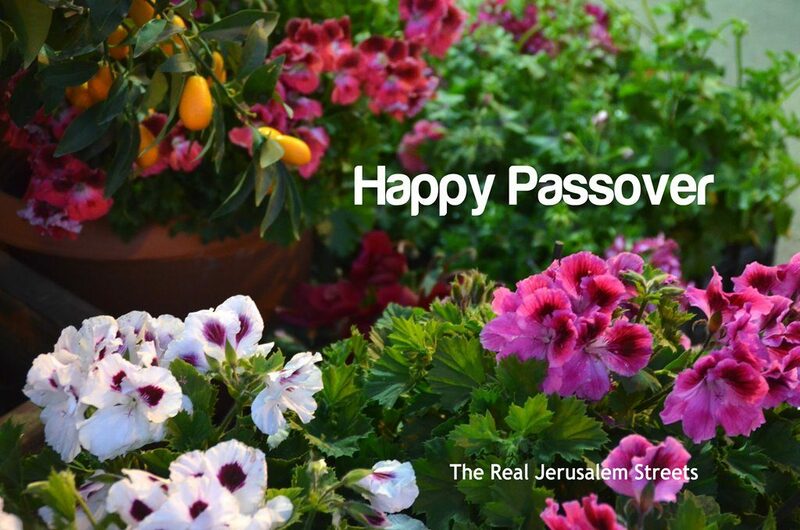 Each week maps and information of the approximately twenty locations are available in Hebrew, English and Arabic. Music and bands perform in multiple locations. 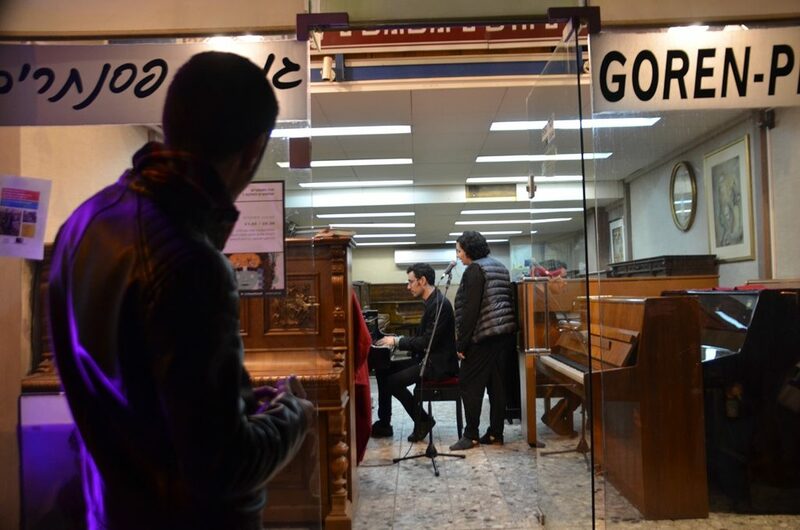 An opera singer was singing in this shop. 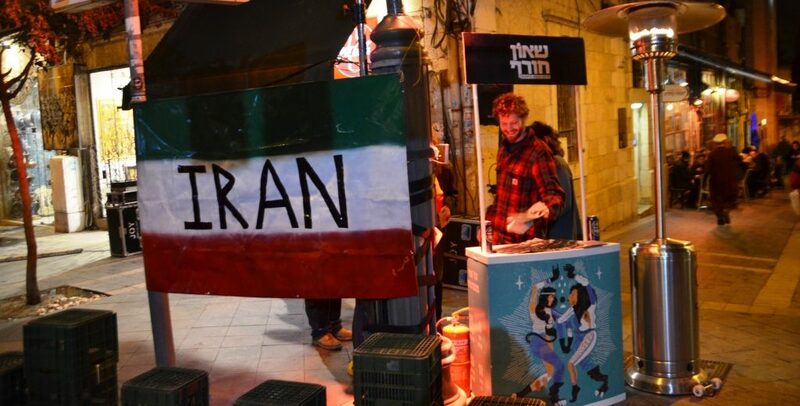 Art was on sale at a market set up along Ben Shetach Street. 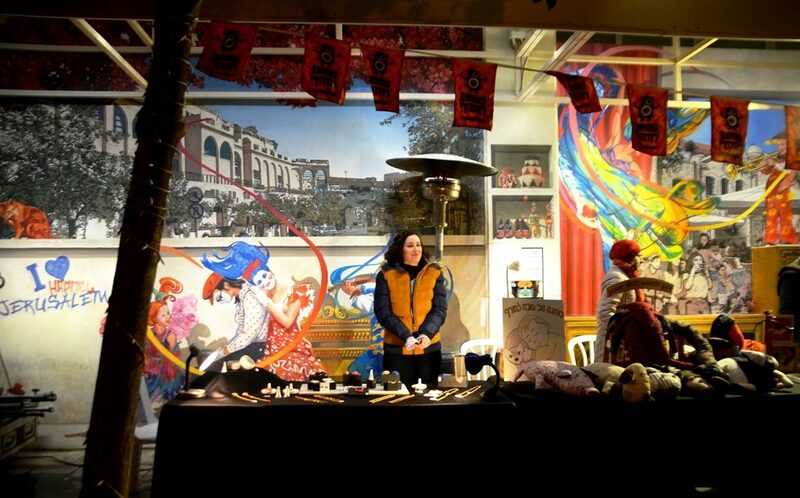 Actors in costume arrived for street performances. At least I assumed they were entertainers, and she was not really the Iranian Ambassador from LA. There were heaters to warm your hands, however, everyone was not outside in the cold. This group who preregistered enjoyed a baking demonstration with special breads. I went early to get photos before the crowds came to party until the sound curfew at 11:00 pm. 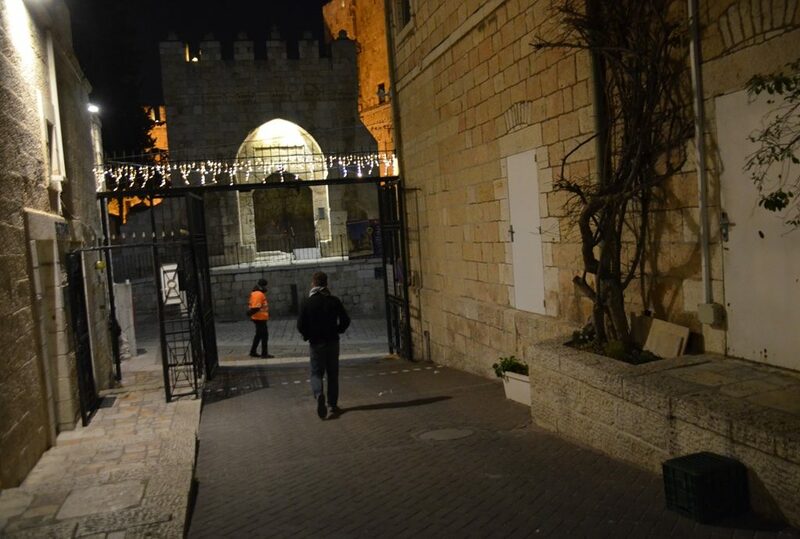 February 18, Shaon Horef moved to a new location, the Old City at Jaffa Gate. 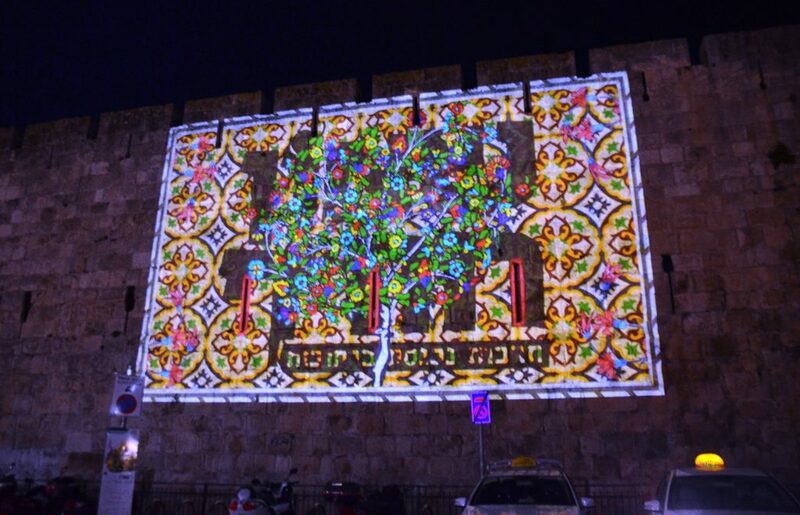 It was inspired by Armenian ceramics, and the animation was by Yavin Ben Reshef. 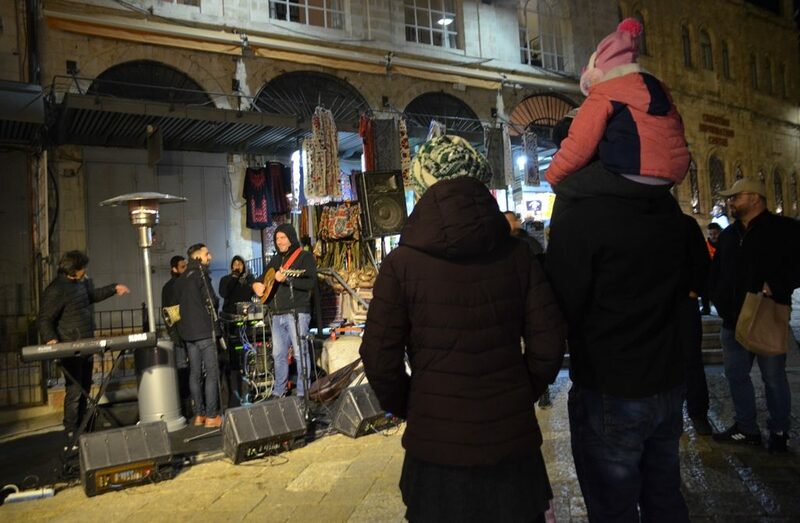 Inside Jaffa Gate musical performances attracted visitors of all ages. 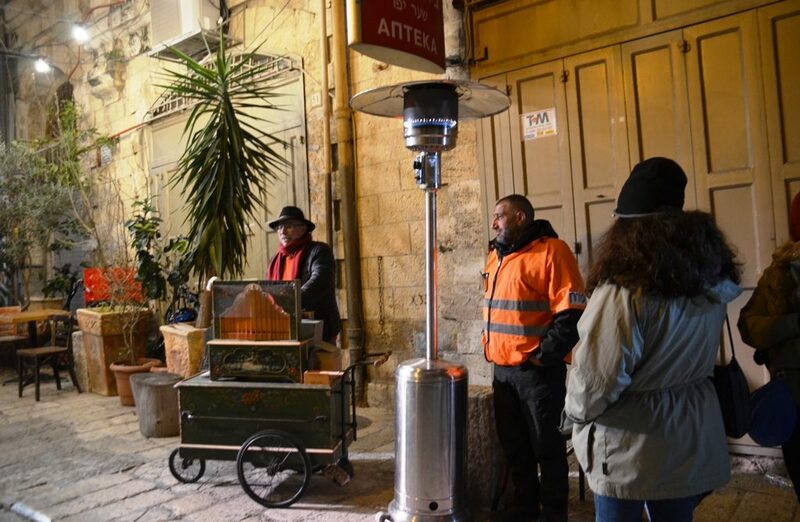 “Sounds from the Box” a street singer and a magical music box that plays French chansons was outside Jacob’s Pizza, near the Latin Patriarchate. 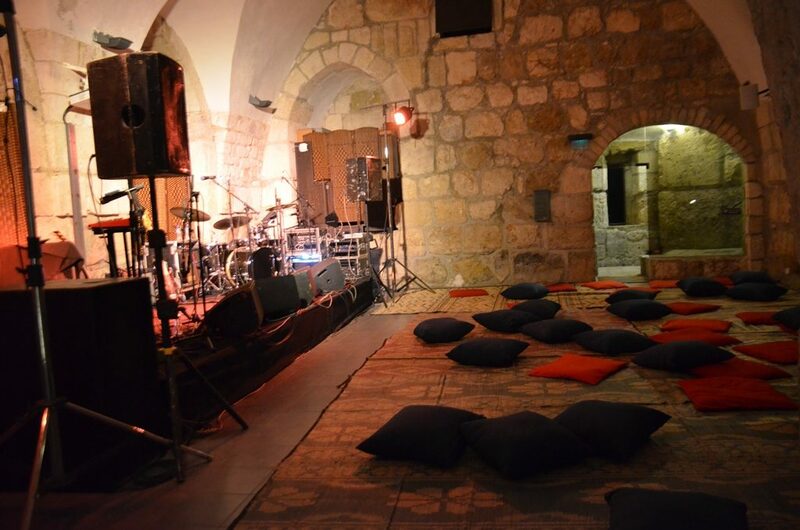 Inside the Tower of David, several venues were readied for multiple musical performances to last all night long. 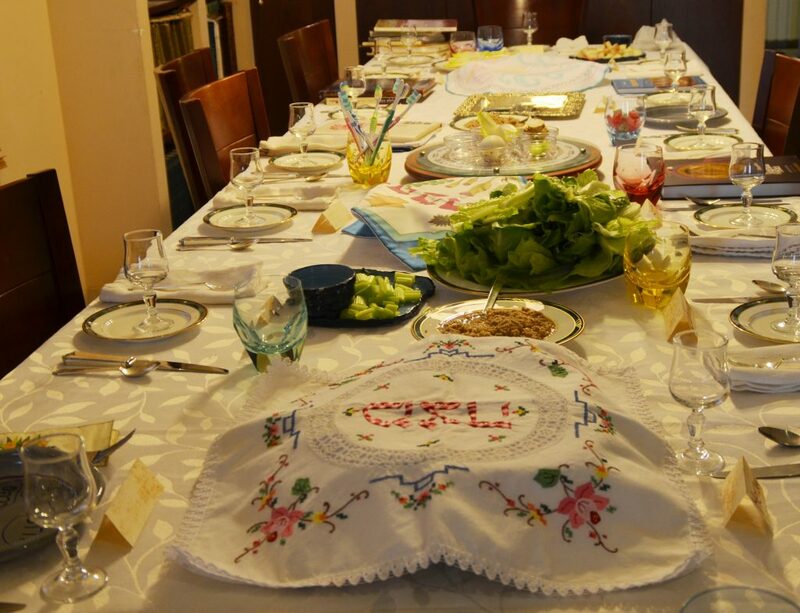 For this Shaon Horef, an after-party was to start at 11:00 pm! Of the unusual off the main street events were those in this museum in the Christian Quarter. 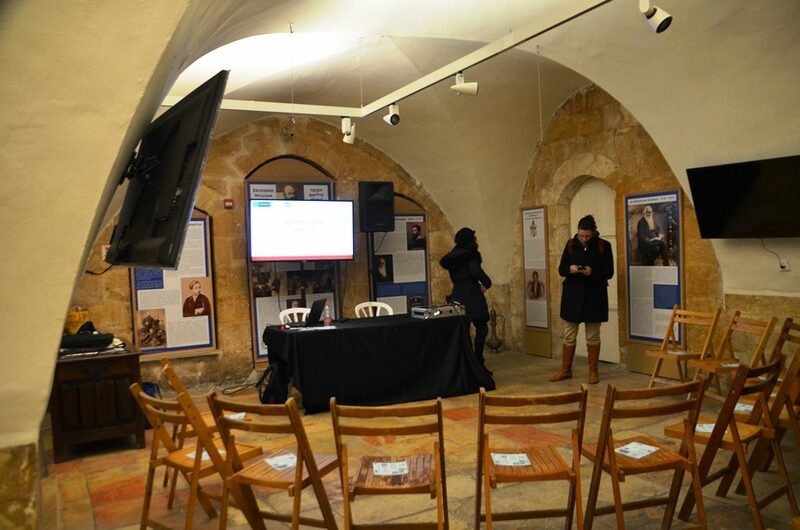 A workshop in”slang in sign language” in Hebrew and Arabic was all set up and ready to go. With eighteen locations on the program, there was no time to stop and sit. I went to see what was happening on the streets. 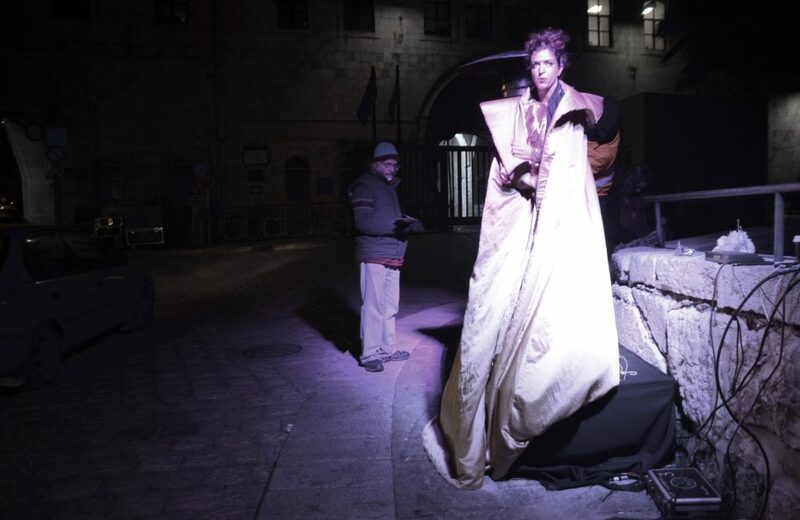 This street performer outside the Tower of David was getting ready and trying to stay warm. This week everyone could be an artist and were invited to paint. 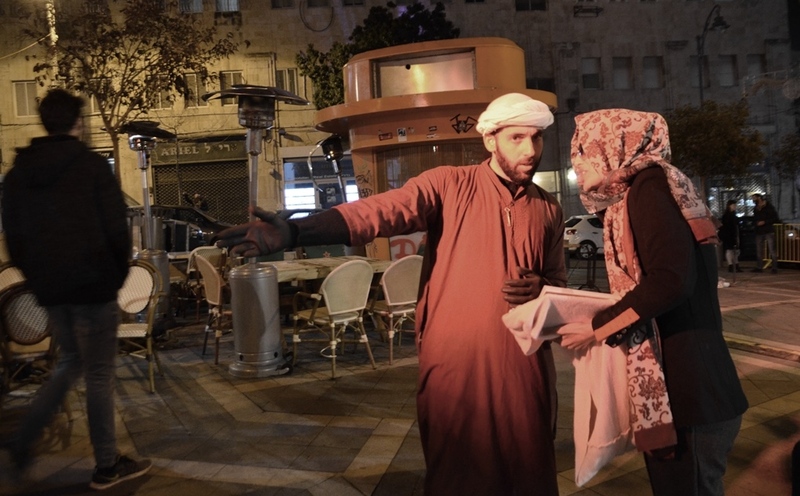 These festivals provide an opportunity to see Jerusalem streets from different angles and perspectives. 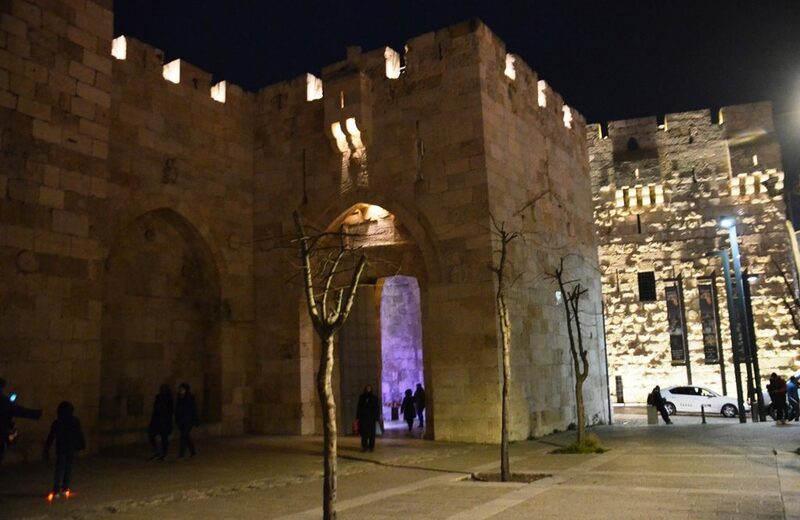 Do you recognize the entrance to the Tower of David in this photo? Not everyone wanted their photo taken! Not really. 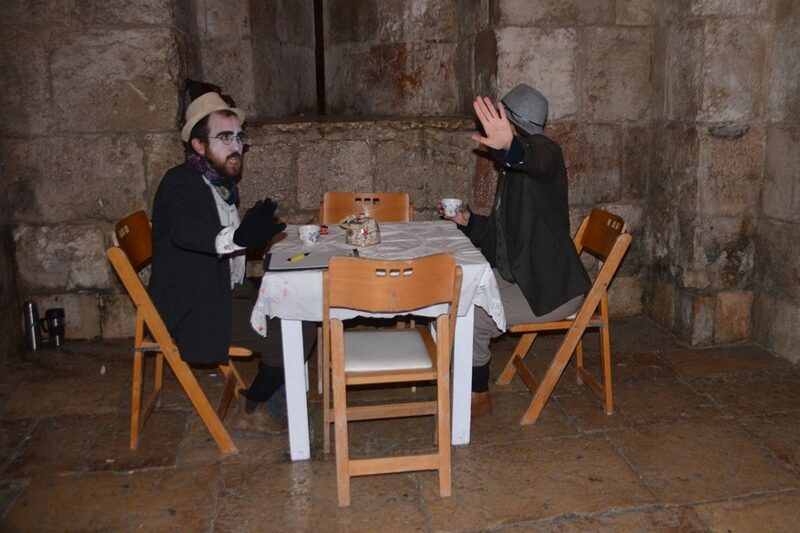 These actors were actually inviting people get in their act and sit at their table which was set up by Jaffa Gate. 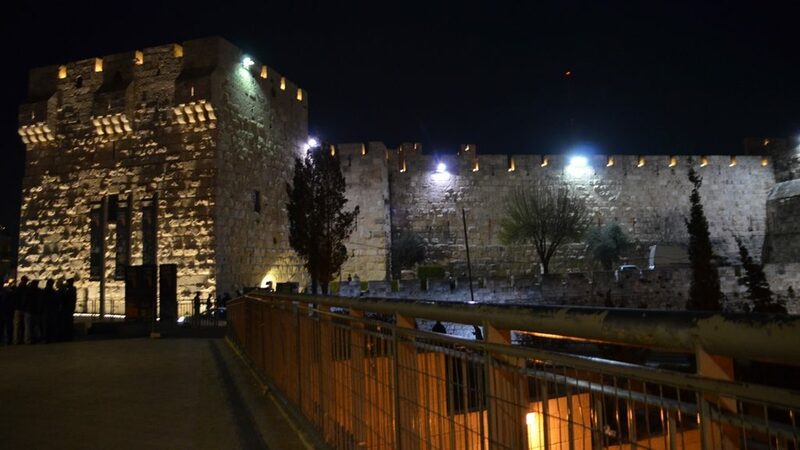 Shaon Horef was inside the walls of the Old City near Jaffa Gate. I think the area outside is lovely to photograph any night. I am ending with a couple of short videos, as music is an important aspect of Shaon Horef. From week #2 at Shlomziyon HaMalka and Ben Shetach Streets. 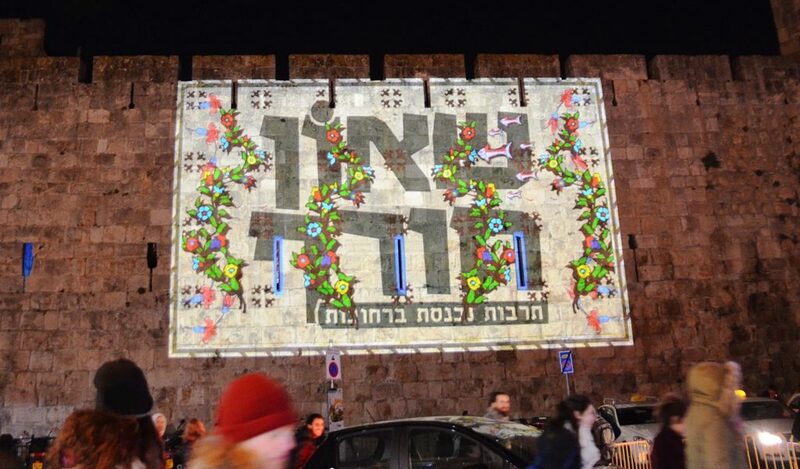 From week #3 at Jaffa Gate, the light projection with Armenian theme. 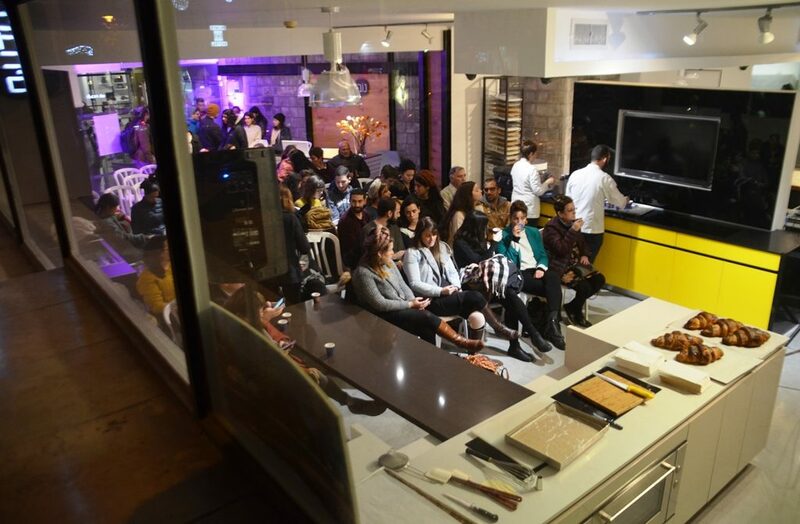 For the last Monday in February, Shaon Horef moves to Talpiot and HaUman Street. Fifteen locations are on the map. 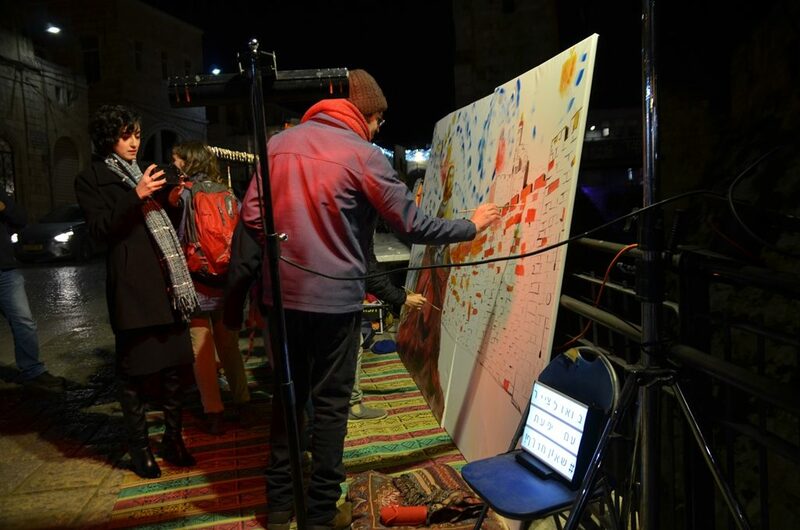 Winter Noise, with an art market, loud music and entertainment, is for all those brave enough to venture out on the cold Jerusalem streets. 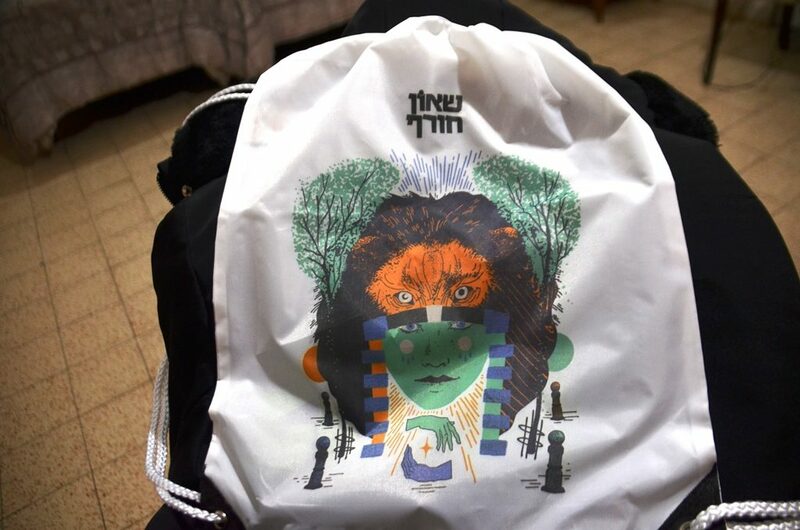 I won a Facebook contest and got this Shaon Horef bag. I do not remember the last time I entered a contest and won anything. 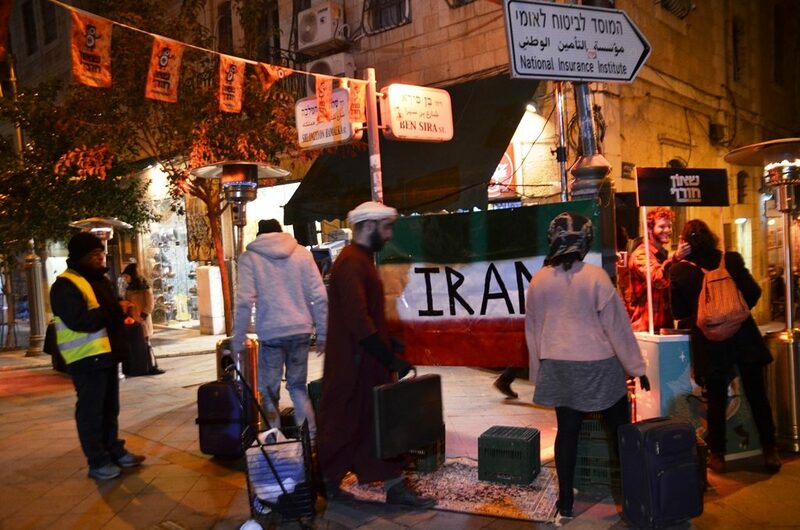 I am one of thirty people who won this prize, so look for us out there on the Jerusalem streets. 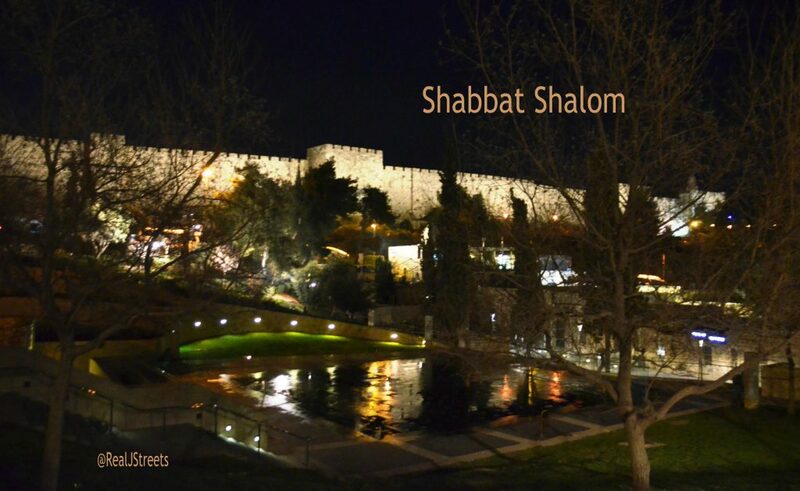 Jerusalem, Israel, winter nights are cold, but some sites are as photo worthy as by day. On the way home from the Jerusalem Winner Marathon launch, I passed through Teddy Park to Mitchell Park to see the new ice skating rink. This was the view. The Teddy Park fountain is not nearly as popular in winter as on hot summer days when it is filled with people, but still worth pausing to appreciate.